You know all those movies where teenagers have, like, THE SUMMER OF THEIR LIVES? This summer is probably not going to be that. The last thing sixteen-year-old Maisie Martin thought she’d be doing this summer is entering a beauty pageant. Not when she’s spent most of her life hiding her body from everyone. Not when her Dad is AWOL for Christmas and her gorgeous older sister has returned to rock Maisie’s shaky confidence. And her best friend starts going out with the boy she’s always loved. What I Like About Me is the highly anticipated debut from Buzzfeed columnist, journalist, editor, and pop-culture connoisseur Jenna Guillaume. 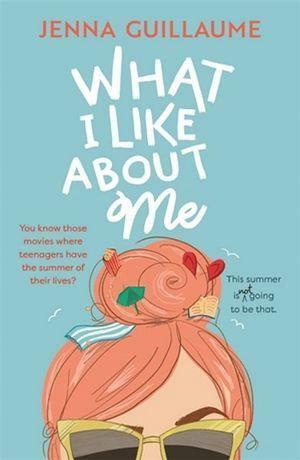 Written in diary form, this witty YA novel takes place over one transformative summer holiday as sixteen-year-old Maisie Martin is forced to face her unrequited crush on her childhood best friend head-on. Crippled by poor self-esteem, but determined to prove a point – to herself, to her glamorous best friend, and to the older sister she feels she can never measure up to – Maisie applies to enter the local beauty contest, and when her application is unexpectedly accepted she finds herself taking her first wobbly steps towards realising her own value. Guillaume is no stranger to writing about big topics – including body image, feminism, first love, and bullying – in an accessible and entertaining way, and What I Like About Me is the perfect vehicle for her chatty and engaging writing style. Heartfelt and unexpectedly deep under its sparkling exterior, this novel features an authentic teen voice, a diverse cast of genuinely likeable characters, a distinctly (and refreshingly) Australian ambience, and a charming protagonist. It’s perfect for fans of Dumplin’ and To All the Boys I’ve Loved Before, or anyone on that difficult journey towards self-love. For ages 14+.